Memorialisation of the dead ranked high among the spiritual tasks of medieval monasteries. This page comes from a kind of diary of the deaths of churchmen, important donors and members of the community that is called a necrology or obituary. Some of the names recorded in it suggest that it probably belonged to the Benedictine cathedral priory of the Holy Trinity (Christ Church) of Canterbury or one of its cells at Dover or Oxford. Set out according to the roman calendar system of kalends, nones and ides, it lists the dates and in columns beside them the names of those who had died on that day in years past are recorded. The names for each day would have been read out at the community's meeting called chapter, which was held in the chapterhouse after the morning prayers (prime) which started at about six o'clock. This commemorated the dead, remembering their souls in the monastery's daily prayers. 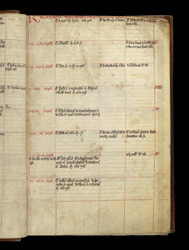 Set out according to the roman calendar system of kalends, nones and ides, this page is for the month of September. Space for names is provided in three columns, more important individuals being recorded in the first. Each name is prefaced by an 'O' for 'obit' ('he / she died') and followed by a brief description of relationship to the community: abbot, donor, monk ('fr') or sister ('soror'). Among the names are Osbern of Muchelney abbey and Lifstan, a Saxon thane who gave Southchurch to the monks of Canterbury (died 823).